Edwin Encarnacion already is impressing the Cleveland Indians. The Texas Rangers have already seen too much of the slugger. Encarnacion hit a tying homer in the eighth inning of his first game with the Indians, and they scored three times in the ninth to open their American League title defense with an 8-5 win over the Texas Rangers on Monday night. "That's why we got him. It's a nice feeling. You could tell he had one thing in mind right there, and he did it," manager Terry Francona said. "He can put the ball in the seats whenever," said Andrew Miller (1-0), who struck out two in a perfect eighth. "I think we're going to really enjoy him for 162 games. ... He's going to make us win." Abraham Almonte hit a tiebreaking single in the ninth off Sam Dyson, who had 38 saves last season. 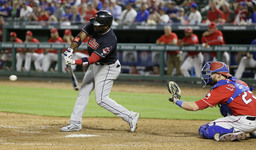 Cody Allen got the save for Cleveland by striking out the side in the bottom of the ninth around Elvis Andrus' triple. Encarnacion has six home runs in his last nine games against the Rangers, including the AL Division Series sweep last October with Toronto. The longest came off hard-throwing Matt Bush and tied this season's opener 5-5. "He got beat with a curveball, by a guy we've seen do it before," Rangers manager Jeff Banister said. Encarnacion homered only once during spring training, in his last exhibition game, after signing a $60 million, three-year deal. The slugger had 42 homers and 127 RBIs last season for Toronto. Making his first opening-day start for two-time defending AL West champion Texas, Yu Darvish had a 5-1 lead. Rougned Odor homered twice and drove in four runs in his first two at-bats since a new contract last week that the Rangers sealed with two horses. Carlos Gomez hit a 461-foot homer. Jose Ramirez also homered for Cleveland. Tyler Naquin's leadoff single began the ninth-inning rally, Yandy Diaz sacrificed and Almonte singled. Carlos Santana added an RBI double and scored on Michael Brantley's single. Indi Corey Kluber, the 2014 AL Cy Young Award winner, made his third consecutive opening day start for Cleveland. He gave up three homers and five runs over six innings. Darvish, entering the final season of his six-year deal, allowed four runs while walking five and throwing two wild pitches over 6 1/3 innings. The Indians got a run in the third on a sacrifice fly that turned into an inning-ending double play. The run counted because Almonte scored before the double play was completed with an out at second base. ... Darvish got out of a bases-loaded jam in the fifth with a 1-2-3 double play before Brantley's inning-ending groundout. Gomez hit only the 20th homer into the second deck of seats in left field at the Rangers ballpark that is now in its 24th season. The last player to do it before that was Nelson Cruz for Seattle on April 29, 2015. The last Ranger was Cruz, on May 14, 2012. Indians: LF Brantley went 1 for 5. He was limited to 11 games last season following right shoulder surgery and another procedure to repair a biceps problem. .. 2B Jason Kipnis started the season on the DL with right shoulder inflammation. Rangers: 3B Adrian Beltre, going into his 20th season only 58 hits shy of 3,000, missed opening day for only the second time. He's on the 10-day disabled list with right calf tightness. He missed the 2001 opener for the Los Angeles Dodgers after appendix surgery. Rangers RHP Dillon Gee, who agreed to an assignment to Triple-A Round Rock after being in camp on a minor league deal, got a one-year contract with a $2 million salary in majors and $180,000 in minors. The deal includes up to $1 million in performance bonuses based on innings - $150,000 each for 100, 120, 140 and 160, and $200,000 apiece for 180 and 200. Indians: RHP Carlos Carrasco starts for the first time since being struck by a line drive that broke a bone on his right hand last Sept. 17 and forced him to miss all the postseason. He had some elbow discomfort this spring. Rangers: Martin Perez starts the Rangers' second game for the third time in four seasons. He made a team-high 33 starts last season.